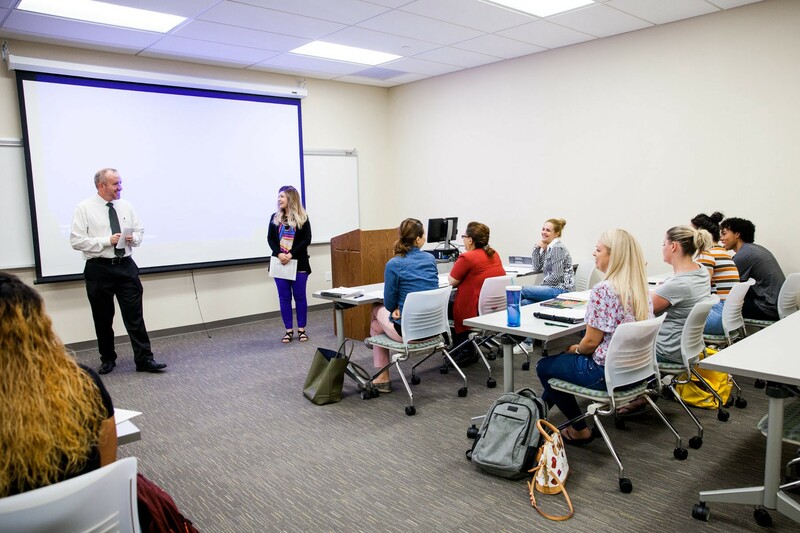 RCBC President, Dr. Cioce greeting students in the classroom on the first day of classes on August 29. Rowan College at Burlington County began its 50th academic year this week. Michael A. Cioce, acting president and vice president of Enrollment Management and Student Success, welcomed students in their classes and launched the college’s first official presidential Twitter account @RCBCPresident. Cioce officially starts moves from acting to president to president on Saturday, Sept. 1, and the college has plans to officially install Cicoe as its sixth college president in two weeks. The community is invited to an installation ceremony and reception at 4 p.m. Friday, Sept. 14, in Votta Hall. Those interested can RSVP at rcbc.edu/installation. According to college officials, Cioce was instrumental in many of the college’s recent achievements. These include: enrollment increases, a 3+1 program with Rowan University that reduced the cost of a bachelor’s degree to what officials say is less than what most colleges charge for a single year, increased opportunities for high school students to earn college degrees and an improved approach to student services from what officials describe as the new state-of-the-art Student Success Center. Cioce was the first in his family to attend college and earned his doctorate in higher education leadership from the University of Pennsylvania last May — a month in which he led RCBC’s commencement for the first time and received his presidential appointment from the Board of Trustees. Cioce first joined RCBC in 2010 as director of the financial aid office. Since then, he was elevated to executive director of enrollment management, and vice president of Enrollment Management and Student Success.